Seating: 7000 (approx) covered in 3 separate stands called Main, Knowles and Nelson, 600 (approx) uncovered on back straight. The track started to be built on 9th June 1975 and was opened for training in June 1976. The original surface was 3M Tartan. The complex which originally just comprised the track and Main Stand became fully operational on 1st April 1978 and the official opening meeting was on 11th June 1978. The track was resurfaced with Polytan PUR in 2000 as part of a £1 million improvement programme which also included a new centre green. 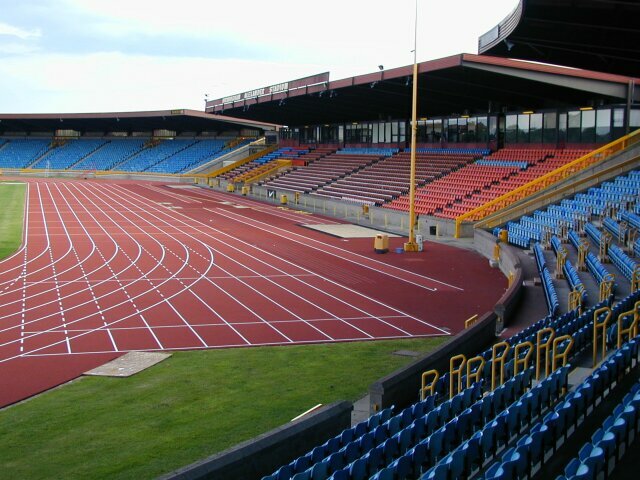 This is one of the UK's premier athletics stadiums and in recent years has been the venue of the AAA championships. There is no disabled access to the Main Stand but there is to the other two. The steeplechase water jump barrier is adjustable both in length and height and was built in 2000. The track has its own website. There are reported to be plans for an indoor facility at the track which will be built sometime in 2001.